Prime Minister Ranil Wickremesinghe’s wife Prof. Maithri Wickremesinghe has made a request to President Maithripala Sirisena not to grant presidential pardon to Ven. Galagodaaththe Gnanasara Thera who is currently serving a jail term. 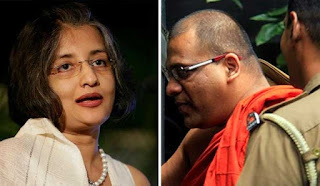 The letter bearing 252 signatures under the title, “Don’t accord the presidential pardon indiscriminately” sent to the President, Prof. Maithri Wickremesinghe had also signed the open letter requesting that Gnanasara Thera not be granted presidential pardon.